A Resilience Festival, some Warmer Homes, and turning carparks into food gardens! In this month’s Transition podcast, we go into more depth with three of the stories from this month’s Transition round-up. We hear about Transition Guelph’s recent ‘Resilience Festival’, what Marsden and Slaithwaite Transition Towns did with their LEAF funding, and what happened when Transition Belper suggested turning a local car park into a vegetable garden. Transition Network hosted a one-day conversation in London to explore the scale of the economic challenges we are facing, what Transition is already doing to respond to that, and what else it might do, or how it might adapt what it does to be more appropriate to these fast-changing times. 150 people from across Spain gathered in Zarzalejo for the country’s first Transition gathering. In a few weeks a whole supported Transition Streets programme will be coming out whereby you will be able to run it in your community. Putting a spring into local shopping at selected shops in Lewes you’ll be given « free » Lewes Pounds when you spend over a minimum amount. Living without money. The cultural story that is money has such a powerful hold on our minds today that we have come to believe that we could not possibly ever live without it. My father was a war pensioner and as a family we lived in the expectation of the « 20th » of the month when the brown envelope came, addressed to Captain Marriott. It is Better to Travel Joyfully Than to Arrive! Living without money is easy. All you have too do is to stop living in a house and using a car and you’re almost there. « It doesn’t cost anything, » I tell him. « It’s free. » That’s the rub about our culture. Everything comes at a price. Human farming of other animals is in the top three causes of all major anthropogenic environmental problems, from local water pollution to global climate change. « Leaves are easy, » Josiah tells me. « It’s the staples we need to look at. » the big stuff – our daily bread. Aw, Sorry, Didn’t Get Round to That! It has taken quite a few years before I stopped overcommitting myself. When something is Transition it feels different – it just feels good and right, enriching and energising. The links and exchanges between city, market town and isolated rural area are important. Don’t Blame Us, We’re Only The Council! Where are we when it comes to the stories we tell about our councils and how we relate to them? The power of an Incredible Edible name. Would some working groups fare better with separate identities? What is it to make oneself at home, within a community of living beings, as if one belonged? Nothing will change outwardly unless we come from affection for the places we live in. In Norwich Foodbank (who emergency give food to families in crisis) fed 1,760 families in the last 6 months. The story we are taught to believe in is the story of power. How do you actually go about living without money, or at least with very little of it? Alexanders are everywhere you look at the moment… only it’s difficult to find that many people who like the taste. Those of you who have seen ‘In Transition 2.0‘ will have noticed the song that closes the film, ‘Turn the Lights Out’ by Rebecca Mayes, which was composed especially for the film. The song will be released as a single on May 7th, and proceeds will go to Transition Network. There is a video, which features some of the clips you sent in of people turning lights out, and a short cameo from someone you might recognise. Rob Hopkins talk at TedxExeter where he spoke for the first time in detail about Totnes as a case study, and what, after 6 years, we can draw from the experience of Transition Town Totnes. The first ever international day of Permaculture will have events happening all around the globe plus heaps of short video interviews online with leading permaculturalists including Richard Heinberg, Rob Hopkins, Mark Lakeman (City Repair), Charles Eisenstein, Joel Salatin (farmer), Looby Macnamara (new book ‘People and Permaculture‘) and many more. 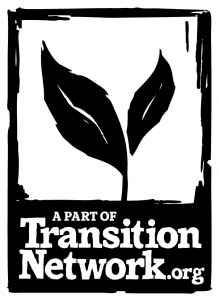 We are delighted to be able to announce today the Festival of Transition, an initiative of new economics foundation, Transition Network, the Ramblers, the arts charity Mission Models Money and the UK Youth Climate Coalition. The idea is simple. You imagine different ways in which a post-transition society might also be a better one, and then try them out as a real-life experiment during a 24 hour period. Costs: We are trying out a new financing model for the Thrive Training, inspired by the « Gift Economy » and Transition Portugal. So all we ask for is a payment of £40 prior to the course. The actual full costs of the training weekend is £105, but we leave it up to each participant to decide after the course, if and how much they want to contribute to this course as a way of gratitude and support of its continuity in the future. Want to know more about « Transition THRIVE » and if it is you? Click here for more info. Does Transition mean firmer buttocks?